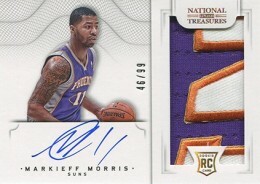 High-end rookie cards are one thing. 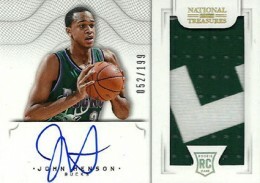 And then there are National Treasures rookie cards, arguably Panini's top first-year basketball cards. 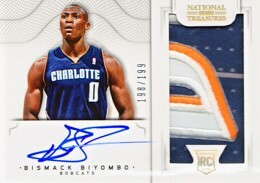 With a double-rookie crop, the 2012-13 Panini National Treasures Basketball Rookie Patch Autographs list is big with several cards commanding big money fresh out of the gate. 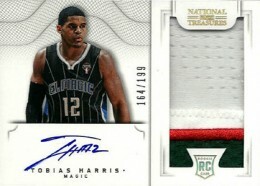 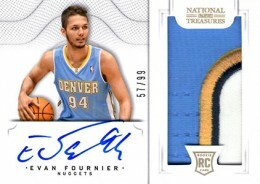 Combining players from both the 2011 and 2012 drafts, a total of 66 players have Rookie Patch Autographs in 2012-13 Panini National Treasures Basketball. 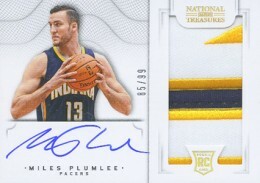 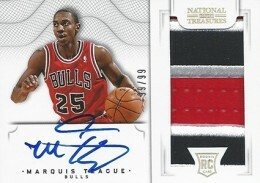 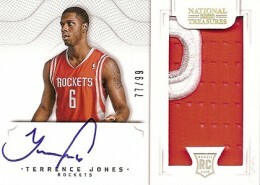 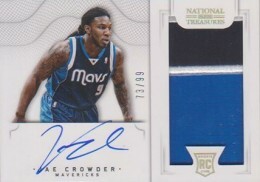 The cards rely on a largely white design to make the on-card autographs and patch swatches pop. 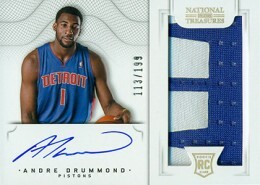 As far as the memorabilia pieces go, they're big. 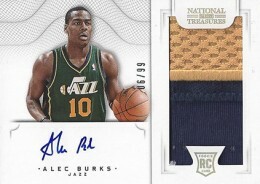 This has made for some very interesting looks. 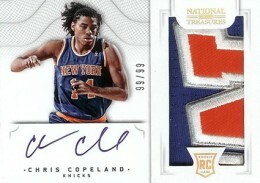 Rookie Patch Autographs have three parallels. 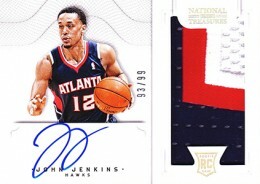 Jersey Numbers (#/25) use a different photo. 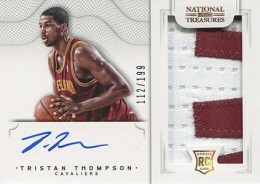 The relic window is cut to the shape of the player's number. 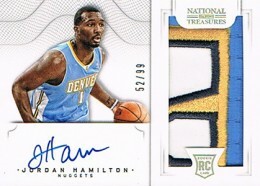 There are also Gold Horizontal (#/5) and Logoman (1/1) parallels. 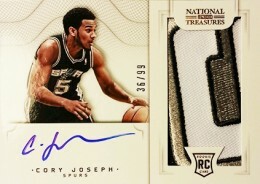 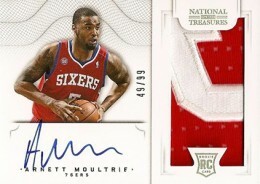 All 2012-13 Panini National Treasures Basketball Rookie Patch Autographs are serial numbered. 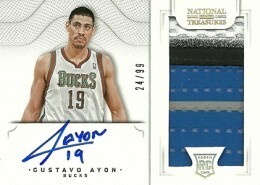 All but one are limited to either 99 or 199 copies (Alexy Shved has 25 cards). 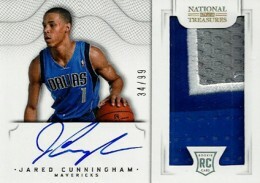 Usually when there are tiered rookie groupings like this, the top players are the short prints. 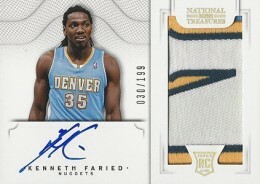 This isn't so with 2012-13 Panini National Treasures Basketball. 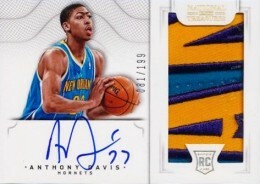 Kyrie Irving, Anthony Davis and other top players are, generally, the more plentiful cards. 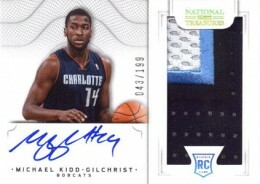 The checklist separates the 2001 and 2012 players. 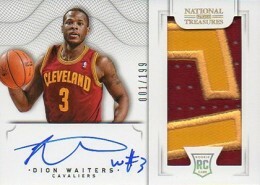 Between them is a gap in the checklist that's filled with regular autographs from some lesser-name rookies. 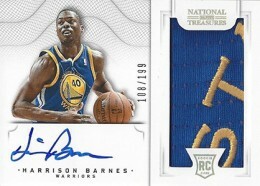 A notable omission from the 2012-13 Panini National Treasures Basketball Rookie Patch Autographs list is Damian Lillard. 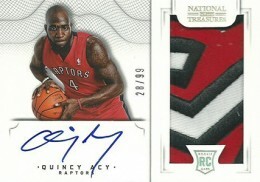 That's because he has an exclusive autograph deal with Leaf. 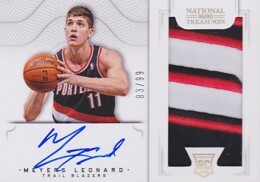 As a result, Lillard is grouped with the veterans. 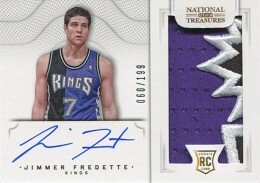 His card is still a rookie card, though, and is numbered to 99. 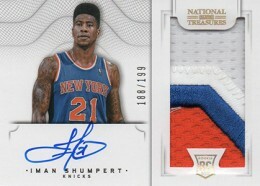 Don't expect to find any of these cheap. 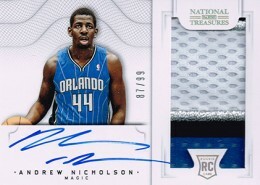 Top players can go for four figures, no problem. 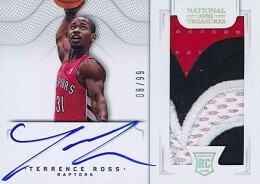 Even lesser players hit three figures. 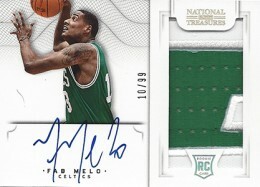 Like Upper Deck's Exquisite rookies before them, there can be some big upside if a player breaks out. 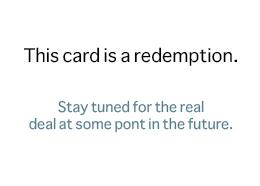 But whenever you're spending so much on a single card, there's lots of risk involved as well. 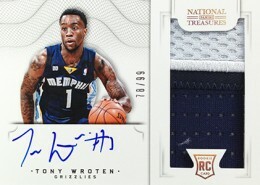 Below is a full visual guide to all of the 2012-13 Panini National Treasures Rookie Patch Autographs that breaks down the entire set. 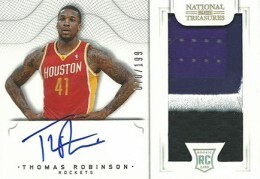 It includes print runs, team info and images of every card that isn't a redemption. 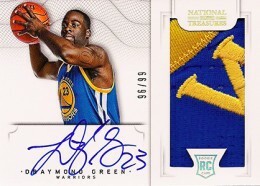 Click on the player's name or image to shop for singles on eBay. 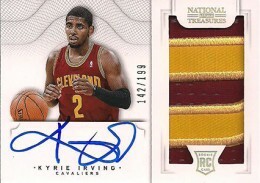 2012-13 National Treasures Factory Sealed Basketball Hobby Box Kyrie Irving RC?